Giving God Your Best Is . . .
God exhorts us to do all for the glory of God (1 Cor. 10:31) and to work at whatever we do with all our heart (Col. 3:23). And, we are to “do it all in the name of the Lord Jesus” (Col. 3:17). 2 Timothy 2:15 says, “Do your best to present yourself to God as one approved …” We read of our need to test our own actions (Gal. 6:4) and to “run in such a way as to get the prize … not like someone running aimlessly” (1 Cor. 9:24-27). Certainly verses like these suggest that we give God our best. Before continuing on, please be sure to read the previous post for some clarification of what it does not mean to do or give our best to God. What follows must be read with an understanding that this is not about gaining merit or applause but rather honoring God and doing whatever we do through His grace, power, and strength, not self-effort. 1) Your best involves giving God your total being. Jesus quoted the greatest commandment as loving the Lord “with all your heart and with all your soul and with all your mind” (Matt. 22:37). The whole of who we are is the best we can give Him which is why this site refers to our best fit in ministry as that which involves all of who we are. To give God only a part of ourselves falls short of loving Him with “all” of who we are. To present ourselves to “as a living sacrifice, holy and pleasing to God” as commanded in Romans 12:1, is only reasonable in light of what God has done for us. 2) Your best involves giving God your first of everything. Throughout the Old Testament we read of the Israelites giving God the first fruits and the best of the flock. We serve the same God, still worthy of the first and best of our time, efforts, and resources. To give Him leftover or misdirected time and energy isn’t giving Him the best He deserves. 3) Your best involves giving God your most superior work. To give God a half-hearted or sloppy effort falls short of doing whatever we do “for the glory of God” (1 Cor. 10:31). How can we be “a workman who does not need to be ashamed” if we inaccurately represent Him (2 Tim. 2:15) because we didn’t take the time required to get it right? In light of these three points, we must conclude that to give God our best, we can’t compartmentalize our lives — God time, me time, work time, family time. All of our lives, at all times and in every way, must be seen as God time. 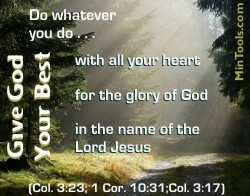 Wherever we are and in whatever we do, we do it all to the glory of God! Excellence: Is It Really All in the Details? This entry was posted in Miscellaneous .